The Iberian is found in southern Spain. It includes the Extremadura Red, Jabugo Spotted, Black Iberian and others. The Black Iberian pig, also known in Portugal as Alentejano, is a breed, Mediterraneus, of the domestic pig (Sus scrofa domesticus) that is indigenous to the Mediterranean area. The Iberian pig, whose unique origin can be traced back to ancient times, is found in herds clustered in the central and southern territory of the Iberian Peninsula (Portugal and Spain). The most commonly accepted theory is that the first pigs were brought to the Iberian Peninsula by the Phoenicians from the Eastern Mediterranean coast (current day Lebanon), where they interbred with wild boars. This cross gave rise to the first Iberian breeds whose origins, in this case, can be traced back to about the year 1000 B.C. 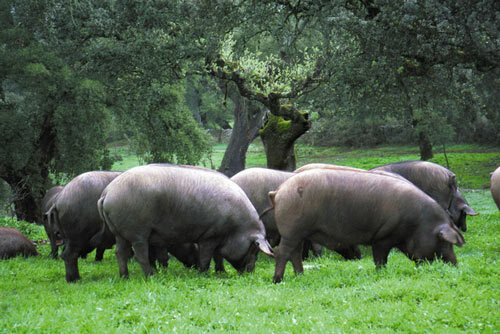 The production of Iberian pig is deeply bound to the Mediterranean ecosystem. It is a rare example in the world swine production where the pig contributes so decisively to the preservation of the ecosystem. The Iberian breed is currently one of the few examples of a domesticated breed which has adapted to a pastoral setting where the land is particularly rich in natural resources, in this case the holm oak, gall oak and cork oak. The numbers of the Iberian breed have been drastically reduced since 1960 due to several factors - the outbreak of African swine fever, the lowered value of animal fats, and the massive introduction of more efficient foreign breeds.In the last few years, however, this population bottleneck has been reversed, and the production of pigs of the Iberian type has increased to satisfy the new demand for top quality meat and cured products. At the same time, the old breed structure, with differentiated varieties locally distributed, has been replaced by a pyramidal structure based on crossbreeding with Duroc. Consequently, some ancestral varieties have disappeared, and others are endangered or blended, necessitating a new design for programmes of conservation of these genetic resources.